Staling on the T is the phenomenon in which you are arrived on the T too soon, i.e. before your opponent has make his shot, this causes you to plant your feet on the ground making it harder to move again in an efficient way. By staling on the T you are more exposed to unplanned shots from your opponent and in the long run you will consume more energy because you are constantly wasting your momentum. The reason why you stale on the T is that you tend to rush when moving on court. What I mean is that everytime you see the ball you instantly move toward it and as soon that you have done your shot you rush to the T.
Although this is surely a demonstration of willingness to put in hard work, moving this way will hinder your game on the long turn and this movement pattern is surely not the ultimate destination you want to go reach. Try instead to walk as much as you can. Do this especially with long shots, and for shots that bounces of the side wall. In fact whenever a ball goes out of the side wall, the more you wait for it, the more it will come to the center, forcing your opponent to back off in order to avoid a stroke. Also try to move slow whenever you are heading back to the T, in fact if you move slow and keep directing toward the T what will happen is that when your opponent will actually make the shot you will still be moving, making it easy for you to head directly toward the ball and keep your momentum. Make sure to keep your momentum when you are heading toward the T.
Court movement is on the top 5 basic skills you need to develop in order to amp up your squash. Lack of proper training get shown pretty obviously by the following mistakes. Movement on court should flow and be as efficient as possible. Probably the most hurtful advantage to a player who has a lot of stamina is the fact that he moves too much. By constantly running a player can reach the opponent's shots, yet only by moving with complete control and uttermost efficiency can a player take control of the game. When playing most players tend to run toward the ball just as an automatic reaction, instead try to plan your movement in a way that makes you able to reach the ball with the least effort and the most efficiency. As i said often: Court movement is the skill of being able to move efficiently toward the ball in a way that lets you make a drive and eventually choose not to. The habit of moving too much on court has many consequences: it cause the player to consume more energy, it forces the player to position himself in a way that is not optimal (which makes the shots inaccurate), it causes the player to rush to balls that he could otherwise reach without any effort (such as in situations that are related to the triangle theory, in which waiting causes your opponent to place himself in a position that is unfavourable). Running too much causes also the mistake of staling in the T, which consists of a player reaching the T too soon, and then staying there with his feet on the ground, which causes to loose momentum and therefore causes the next sprint to be slower and more energy costly. Solution: Take the effort of learning proper court movement, try to walk constantly instead of sprinting and stopping. Move slower when you are close to reaching the T to make sure that you keep your momentum. Realise that some shots are more effective if you wait on them. Take big steps, especially the last one when reaching the ball. The tendency to go straight toward the ball has its maximum expression in moving oblique. Whenever you move oblique you end up placing your body in a position that doesn't allow you much choice. This movement pattern has many consequences depending on the level of the player. At starting level this will force you to make every shot as a cross-court. You will always have your body slightly oriented toward the front wall and that will cause you to make a cross-court as i explain in the body shot theory. Reduce your precision because your body is oriented in an improper way. Move too close to the side wall, especially against short shots (such as the drop), by moving oblique the last part of your swing will inevitably hit the side wall, making it harder to hit the ball. Solution: You should move by staying in the center relative to the sidewall as much as you can and move toward the side only if the ball is good enough. To make this movement trajectory a habit i suggest that you take a little amount of time every single time you go in the court to do some ghosting as I explain it in the court movement video. 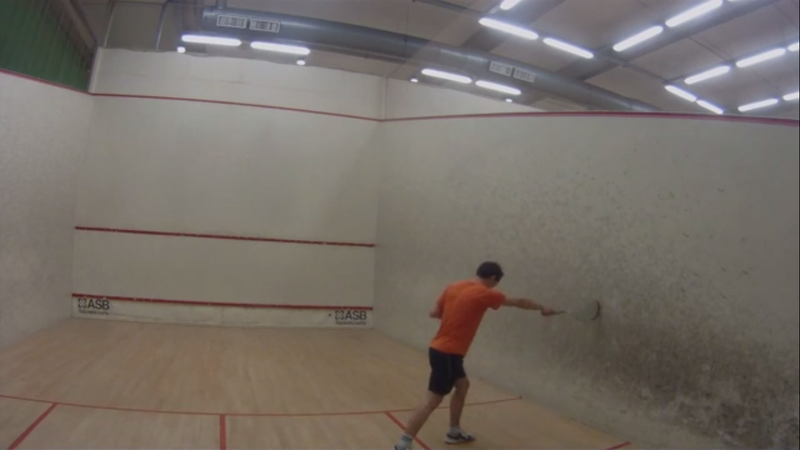 As I've shown in the court movement video, the swing in squash should be done with an extended arm, this gives you the chance of reaching the side wall by doing only one step from the center. You will come too close to the side wall and smash your racket. This is costly (for the racket), energy draining (as the time goes by you end up running twice as much as you should have), and it ultimately hinders the chances that you recover the ball. Solution: Extend your arm and move toward the side wall. Place your racket against the side wall while maintaining the extended arm, now watch your front foot (left in the right side of the court, right on the left side of the court). You must never move inside the area that is covered by the length of your arm. To make this a habit try to do this simple reminder everytime you fail to recover a ball that is tightly near the side wall. Is a form of boast that has the purpose of scoring a point or forcing your opponent in the front corner. In an attacking boast the ball is really low and it has the most speed possible, whilst a defensive boast is slow and high. Therefore to make a properly useful attacking boast you must learn the proper plate orientation and strength. You can do this exercise by yourself (in the meantime working at your stamina and if you want on your drop shot), by doing boasts and drop shots, or with a partner, by alternating boast and cross-court. Keep in mind that your target is the nick on the opposite side of the front wall. Your boast should never bounce on the second side wall, otherwise it will give an advantage to your opponent. On paper both boast and cross-court are weak shots. Those shots take more time than a drive to bounce twice, giving your opponent more time to react. Yet those are the shots with which many players make the most point. That's because by having the proper timing and possibly an ambiguous body language you can confuse your opponent and score quick easy points. One of the most common situation is if you and your opponent are exchanging drives and you step toward the front wall and forestall the ball, in this situation if you don't make a volley you will probably be able to choose between a drive and a fast boast. This is the situation in which the attacking boast comes in hand. If you catch your opponent off guard by quickly changing your rhythm the attacking boast can be a really powerful shot. I personally use the attacking boast often when i believe that my opponent is giving for granted that i will make another drive. I think the boast is a really unbalanced shot and you should use it sporadically and not rely on it too much, even tho it provides a tiresome exercise for your opponent's knees, it has too many weak spot to be used constantly.